Update 24 March 2016: Salsa now takes reservations and it is highly recommended to make them at least a week in advance. 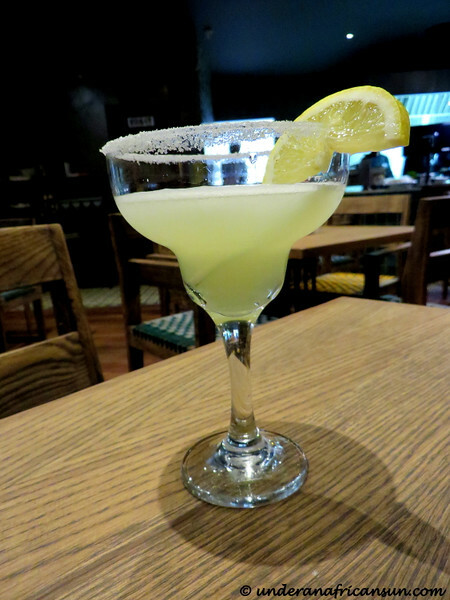 Salsa Mexican Grill is the newest addition to the Jozi Northern Suburbs dining scene, just officially opening this past Thursday. They are located in the Pineslopes Shopping Centre at the corner of Witkoppen and The Straight, right next to the Beerhouse. The really great news for me is that this is really close to home and I couldn’t wait to try this place out. Thursday evening I rang the restaurant to try and make reservations for Friday night and was told they aren’t currently taking any reservations, they are doing walk-ins only for the moment. A bit skeptical about getting in, we rocked up a bit early (for us) for dinner around 7 pm on Friday. We were warmly welcomed and had no trouble getting a table at that time though things were starting to pick up later as we were leaving. The dining area features attractive wooden tables and chairs and an open plan kitchen. I felt the décor was a bit subdued for a Mexican restaurant and I would love to see just a bit more color added. There is a large outdoor patio area which I am sure will be great fun once it warms up a bit. The drinks menu features a nice selection of beer, wine and cocktails (margaritas of course are a highlight). There are also some interesting sounding flavored tequilas if that is your thing, though personally, I gave up tequila shooters sometime in the last century. I opted for a traditional margarita straight up (blended is offered as well) while the Frenchie went the less traditional mojito route. Both were quite good, and we made sure to order a second round just to be sure. Let’s move on to the most important topic, the food. Just for a bit of background info, I lived in Arizona for 11 years and have taken many trips to Mexico so I have eaten quite a lot of Mexican food in my days. 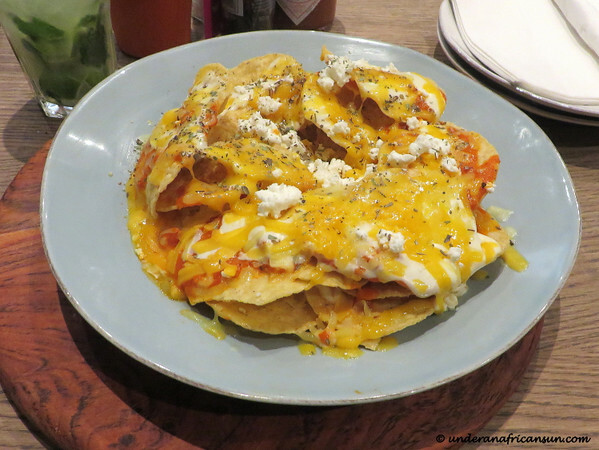 Salsa Mexican Grill tends less towards traditional, heavier, cheese-laden Mexican cuisine and focuses rather on lighter, fresher tastes with a bit of a South African flair. Though I was a bit sad not to see my old favourites of enchiladas, chimis or refried beans on the menu, we were excited to try something new. The menu is basically organized in 2 sections. The first is dubbed “Create Your Own Mexican Feast”. With this option you pick the base (tacos, lettuce cups, burrito, bowl or pizzadilla) and then add the protein (chicken, hake, beef), extras such as rice, black beans, veggies and cheese and finally salsas. Each item is priced separately so the end price will depend on what you pick. The second part of the menu consists of already designed salads, burritos, tacos and pizzadillas as well as some sides and ribs. After much debate, we decided to order a starter and main each. 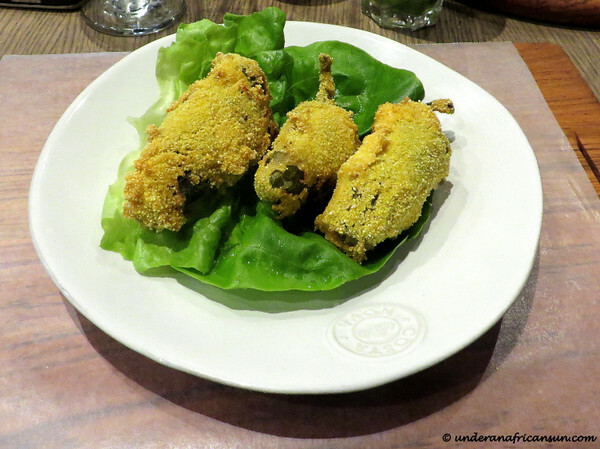 I couldn’t resist trying the Jalapeno Poppers (25 ZAR) and I also talked the Frenchie into the Nachos (55 ZAR) so I could try those too. I liked that the poppers were fried in a very light coating however they could have been spicier for my tastes. It would also be nice to have some kind of dipping sauce served on the side. 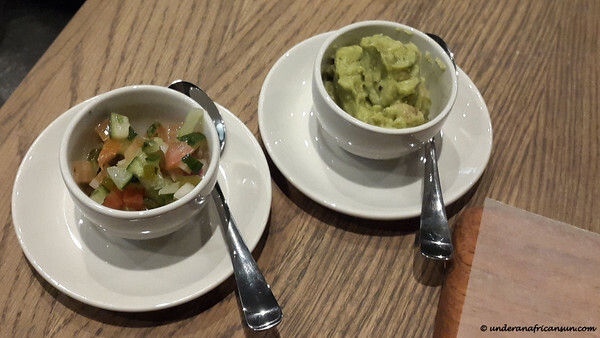 As for the nachos, they only come with cheese and a tomato sauce so we opted to order some guacamole (8 ZAR) and salsa (6 ZAR) on the side, oddly sour cream was not available. While the nachos were good, I would prefer them with a few more toppings. 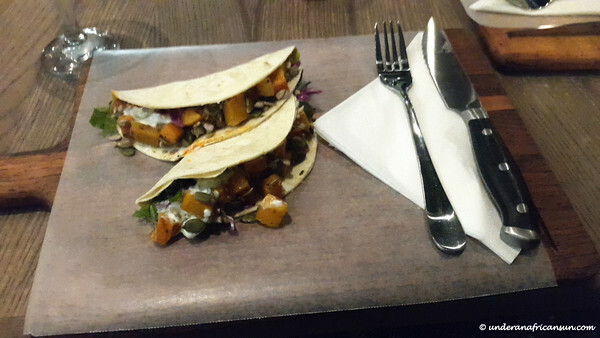 For the mains, I decided on the Butternut Tacos (47 ZAR). This consisted of 2 soft shell tacos with butternut, lime rice, lettuce, cabbage, tzatziki and pumpkin and sunflower seeds. While I cannot call the flavours mexican, it was an interesting and tasty combination. 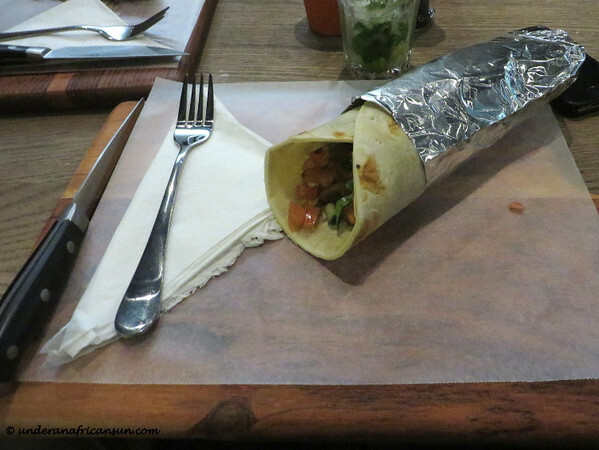 As for the Frenchie, he went with the Original Burrito (79 ZAR) which had beef strips, lime rice, lettuce, veg, black beans, guac and cheese and noted it good but not all that exciting. The service we experienced was really top-notch. Our waiter was knowledgeable, attentive and just a lot of fun. We were also checked on by several managers/owners as well as the chef to make sure everything was fine. Everyone we encountered seemed really excited about the restaurant and eager to please which is always great to see. We certainly will be stopping in again and I look forward to more fun evenings out at Salsa Mexican Grill. You can check out Salsa Mexican Grill here on their facebook page for all their info. 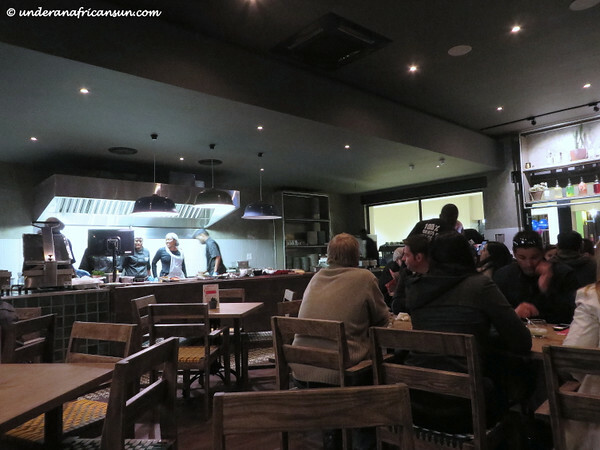 This entry was posted in Food and Wine, Johannesburg, Restaurant Reviews and tagged Food, Restaurant Review by UnderAnAfricanSun. Bookmark the permalink. Tout me semble délicieux, bon appétit !